Breaking news: I just got my 2,000th visitor! It's only 42 days since I got my first thousand, which was 4.5 months after my blog started, so this site has taken a huge leap in popularity since then. Again, I thank all the people who have visited my blog or posted comments to contribute to this millennium - you help keep this site alive. Any feedback is welcome, so send in your ideas about what you think could be improved. I recently installed a content rating system at the bottom of every post, so please take the time to give a rating to any pictures you find interesting. Anyway, gotta go now, I've just about set up my linux system so I'll be back posting any day now! P.S. When I get the time, I'll make a "best bits" collection of the best photos from this millennium. This is just a quick post, I'm backing up my computer and migrating to SUSE Linux at the moment, so I haven't got much time to post stuff for a while. I wanted to put a photo up with this post, but Blogger and Picasa have both crashed on me! Oh well, you might want to take a browse through some of my old photos until I've sorted all this stuff out. Just take a look 'round the "categories" (scroll down - it'll be on the right side of the page), or use the Search box at the top right to look through the 80+ photos to date. 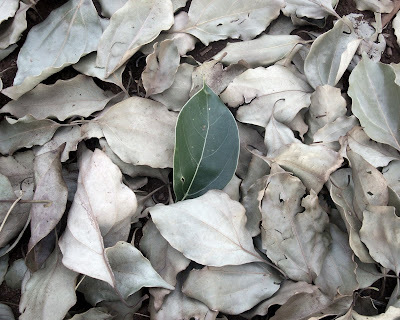 This is a very contrasting picture of a green camphor-laurel leaf (Cinnamomum camphora) resting amidst many brown leaves. It was taken with a desaturizing filter to remove some of the color from the dead leaves, but the single green leaf still stands out clearly from the rest. Here is a very different perspective on this well-known seafood! This is a close-up photo of the scraps left over after a meal of prawns. The prawns' heads and tails are all that is left. The large black eye is the most outstanding part of the prawn heads shown here, especially the center one. The natural body curves are also a feature of this photo, and the detailed look at this common but little-examined creature provides plenty of interesting items for examination. This is yet another example of what amazing photographic subjects can be found just by looking around us. So much of what we see is a wide-angle view of the world - sometimes we can discover many more insights when we just stop and look under our noses! This photo was taken with the Kodak C330 camera. Note: Remember to rate this picture (see below)! I've been asked a few times whether there is any way to rate the pictures that people see on this site. So far, there hasn't been any way to rate an individual picture (apart from writing a comment), so I got working on a way to assign each picture a "star rating", giving users a chance to share their opinion on a photo. I have set up a rating system with spotback.com which does just that. At the bottom of each post, there is a small "widget" showing the overall rating of the post, and each user can simply click in their own rating if so desired. If anyone has any feedback on this rating system, you can post a comment or email me with your ideas for improvement. One major area of consideration is the page load time - does anyone find that this page loads extra slowly? This landscape vista of a lake was taken at Rocky Creek Dam, Lismore. The area is very green, due to recent rain. A dense area of lily-pads is visible at the bottom left of the image. The composition of the photograph is such that the eye is drawn along a zig-zag path into the picture, reaching an apex at the intersection between the mountains and the cloudy sky. 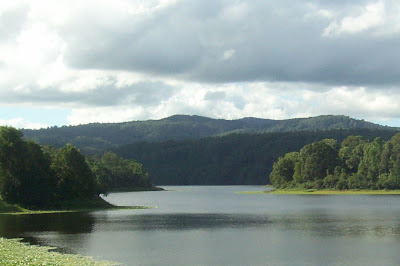 The areas of light and dark trees tend to alternate across the picture, combining with the curves of the lake's (or dam's) water to draw the eye from side to side into the distance. As you can see, I'm testing a post rating system. If you just choose a rating in the box below and click "Add my Rating", you'll see public rating of this post. On the subject of lavenders, I have this photo of a bee just landing on a lavender flower. The blurred bee gives the impression of split-second motion, and the relatively high ISO gives the image a soft grainy texture. Just after I took this photo, I got another photo of the bee on the lavender flower. Photo taken with the Kodak C330 camera (4.2MP). The dark tones of this picture blend nicely, creating a natural over-saturated effect. The lavender blossom in the foreground has small droplets of dew on it, from some early morning rain. The flower in the background is nearly a mirror image of the foreground one, giving another interesting effect. This photo was taken with the Sony DSC-H1 camera (5.1MP, 1/500 shutter, 3.8 aperture). Here is another photo of a flower just after the rain. This one of a balloon vine flower, has water droplets on it, giving a totally different feel to the same photo taken a few days before. This photo was taken with the Sony DSC-H1, with 1/500 shutter speed and f3.2 with bright lighting, making the flower bright enough, but the background is darkened. This morning we got some rain here, so I've been out snapping some of the wonderful pictures you can get when this vitalizing event occurs. This is one of them - a small white flower covered with water droplets. The detail is amazing, and the lighting was perfect with a thick fog producing and even light with gentle shadows. 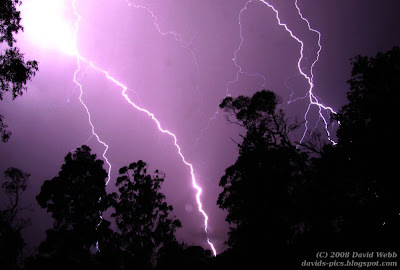 This photo was taken with the Sony DSC-H1, on 1/500th second shutter speed and f2.8, focal length 6.0mm. Sorry for the slow update, I thought blogger had uploaded my post but it hadn't, so these past few days I haven't been able to get a post up! I think I've fixed the problem now, so here goes. This photo is an excellent example of contrasting composition being used to draw attention to the central object of the picture. The leaf in the center of the photo draws your attention toward the right hand side of the picture, while the prickle ("bindie") in the center of the leaf points it's spikes toward the left of the picture. The leaves in the background rotate around the center of the image, making the whole picture focus on the object in the center. The colors also contrast to bring out the prickle. This photo was also taken with the Sony camera, on a high shutter speed and aperture again. A nice close-up (macro shot) of a balloon vine flower in full bloom. This photo was taken with a high shutter speed and aperture setting, creating sharp edges on the flower while keeping the background softened. I am considering the purchase of a new digital camera - the old 4.2MP Kodak C330 point-and-shoot model is great for general-purpose shooting and landscapes, but I need something a bit more advanced to get the best shot in other situations. The camera I am thinking of is the Fujifilm F6500fd, which is designed to look and feel like and SLR, while only costing AUD$499. It features 6.1MP, 10x twist-action zoom, and manual shutter and aperture. Before buying, I have had the opportunity to try a similar camera - the Sony DSC-H1. This 5.1MP camera has 12x optical zoom, and manual features, making it comparable to the Fujifilm. This macro photo of the balloon vine flower was taken with the Sony camera. 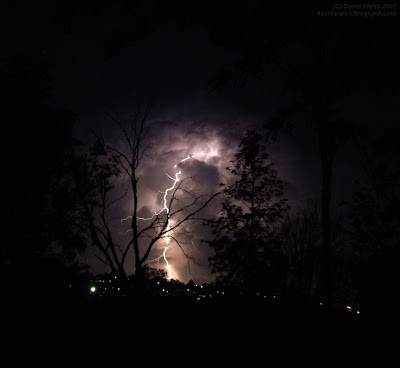 I took this photo some time ago when I was on the East coast of Queensland. The twilight shadows and the moon framed by the palm trees combine to create a peaceful effect. Although this isn't exactly in a "tropical" location, the palm trees make it look like that! 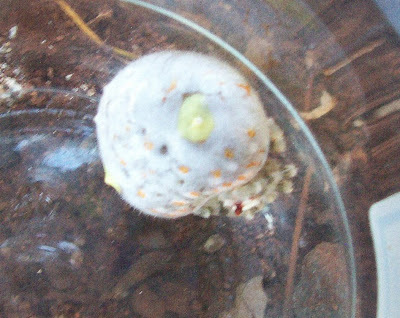 I snapped these two pictures out in the yard today, and initially couldn't identify the spider and sac. 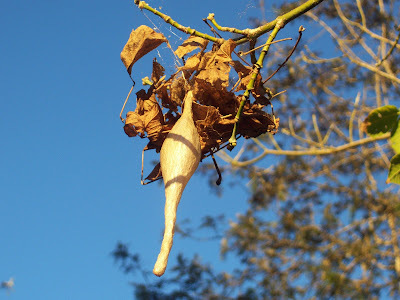 On the net, I found that the spider is called the "Magnificent bolas spider", and the picture below is one of it's egg sacs. For more information, visit the USQ's spider ID chart.